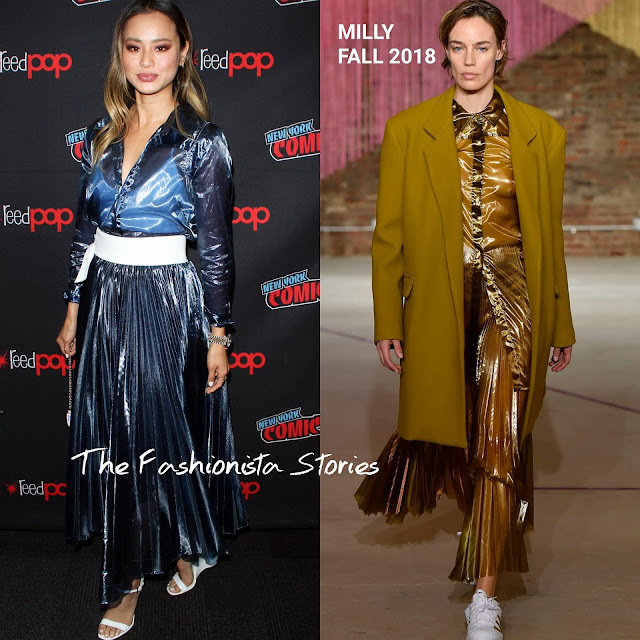 Ahead of the season 2 premiere, Jamie Chung posed on the black carpet at 2018 NY Comic Con panel for her hit tv show 'The Gifted'. Jamie's MILLY FALL 2018 see-through navy shirt and pleated lame skirt was shown on the runway in a different hue. However the navy suits her perfectly. Aslo I love the addition of the wide white belt as it balances out her look. Teamed with the popular PRADA flame wedge sandal, she finished up with smokey eyes and side parted tresses.